This creamy sweet potato soup, is loaded with veggies and makes a hearty meal for the cooler weather. A quick scan of the weather channels will tell you that although its Spring, it’s pretty cold outside! Even here in Florida the weather has been chilly, so I took what is probably my last opportunity until fall and made soup. This creamy blend of sweet and russet potatoes, carrots and onion was a huge success = toddler approved. Anytime I hear “um” followed by a smile I know I’ve found a winning recipe, she ate a whole bowl and still asked for more. If the temperatures outside have you wanting some soup or you’re looking for a good way to get your kids to eat their veggies I highly recommend this soup. 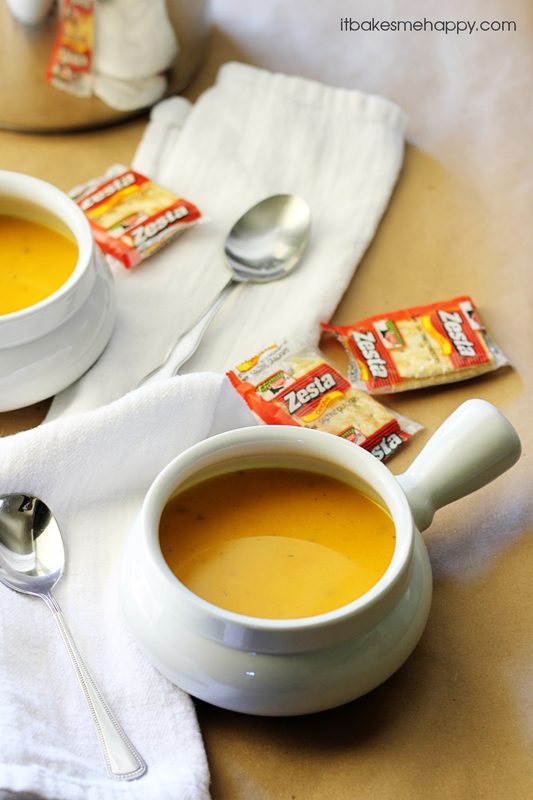 Stay warm and cozy, I hope you’ll enjoy this recipe! Preheat your oven to 375º and line a baking pan with foil. Slice the potatoes into wedges and drizzle them with olive oil and sprinkle on the salt and pepper, roast for 35-40 minutes. In a 3 quart soup pan melt the butter and saute the onion and carrots for 10 minutes. Add the vegetable stock to the soup pot and bring to a boil, simmer until the potatoes finish roasting. Remove the potatoes from the oven and cool to the touch. Remove the skins and add to the pot, cook the soup an additional 5 minutes. Using an immersion blender purée the soup to desired consistency, I like mine smooth but chunky is fine. We are heading into winter shortly, this sounds like the perfect cold night dinner! Love this recipe! We love sweet potatoes over here, and even though its Spring, its still chilly! Thanks for sharing! Looks good, Emily! A nice vegetarian soup. Love it! Where in Florida are you? I live in Stuart but I grew up in Lakeland. Wow…this looks fabulous. I can’t wait to try – Thanks for sharing! Picked up your card at BYB13 and I’m following you in every way possible. Hope you’ll check out my blog so we can get to know each other better! We are in the middle of Autumn and this recipe would come in handy once the cold of Winter hits us ! Thank you for sharing this at our ALL MY BLOGGY FRIENDS party 🙂 Hope to see you again tomorrow! Hi! I am Maggie over at The Love Nerds. I was one of Ginger Snap Crafts co-hosts last week. I just wanted to let you know that I have featured this recipe today on my blog and can’t wait to try it out myself! I would love if you came over and checked out the other recipes as well as my own projects. Thanks!